As Apple gears up for the launch of its 3G iPhone, outside developers and startups are finally going to get to sell or give away their own applications that run natively on the phone (as opposed to being optimized for the Safari browser, as are most legal, third-party apps today). These apps, which are built on the iPhone SDK announced last March, will be distributed through the upcoming iPhone App Store (which apparently won’t launch for a few weeks). These apps will have some limitations (you can only run one app at a time and VOIP services only work via WiFi, for instance), but they will also bring a lot of innovation to the iPhone. We’ve been tracking some of these announcements as companies prepare to unveil their new iPhone apps. They are listed below. There is a good chance more will be announced on stage during Steve Jobs’ keynote today. We will update as we learn more. Please let us know which ones we missed in comments. Zenbe Lists: Webmail service Zenbe (reviewed here) is testing the iPhone development environment with a to-do list application that can be used to keep track of your chores and collaborate with friends and coworkers. 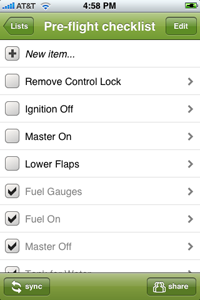 Create task lists, check off items, and sync them with your contacts. Lists can be sent to your friends via email and accessed through the browser when sitting at a desktop computer. The Lists application won’t be integrated with Zenbe’s main email app, at least to start. Super Monkey Ball: It took Sega two weeks to create a version of its popular video game for the iPhone. It will cost $9.99 at the iPhone App Store. Players use the built-in accelerometer to move the character. The Associated Press: New app will retrieve local news based on your location. Also links every iPhone with the app to the AP so citizen journalists can send in photos taken on their iPhones of breaking events, as well as text commentary. Pangea Software (Enigmo and Croman Rally): Two games for the iPhone that will cost $9.99 each. Enigmo is a touch-based puzzle game where you move drops of water around with your finger. Croman Rally is a race game with Flinstone-style cars that players control with the iPhone’s accelerometer. Cow Music: Built by a single developer, Mark terry, in his time, the app is called Band. It lets you play virtual instruments on the iphone and create music. Instruments include piano, drums, guitars. You play the instruments by banging (lightly) on the iPhone. MLB.com’s At Bat: Shows stats and video highlights of baseball games. Modality: An anatomy app for medical students. The app is filled with anatomy drawings and images linked to Google and Wikipedia for more detailed information. MIMvista: Another tool for doctors to view CT scans and PET scans on their iPhones. Digital Legends Entertainment: Another game that took two days to port to the iPhone. Will be available in September. 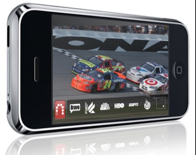 SlingPlayer Mobile: You will soon be able to watch TV on your iPhone. Just like a Slingbox that let’s you access your TV from anywhere around the world, Sling Media is creating a version of its SlingPlayer Mobile app for the iPhone. That means theoretically you could watch all the channels you have at home on your iPhone, as long as the Internet connection is strong enough to stream the video. 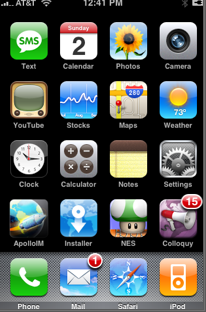 Loopt: The social mobile network is expected to announce an iPhone version of its app. Loopt shows you where your friends are based on GPS and other location-tracking technologies. Loopt is already available on many Sprint and Verizon phones. With the iPhone, it will add AT&T to its roster. Phanfare: Take pictures on your iPhone, add captions, and share them as slideshows on the Web. Phanfare is launching its iPhone version today. Whrrl: Another mobile social network geared at sharing opinions and reviews of local establishments with your friends. The company behind Whrrl, Pelago, was is part of Kleiner Perkins’ iFund. (Read our review here). Citysense: Nightlife tracker. Let’s you see the city’s hot spots by showing heat maps of where people are via their cell phones and other signal-emitting mobile devices. Only available in San Francisco for now. A demo app for Sense Networks. iCall: VOIP on your iPhone. We covered it here. Glide 3.0: It’s your desktop on your iPhone. Remember the Milk: Take your to-do list with you. AOL Radio: Web radio that tunes in to local CBS stations.